Ask any gadget enthusiast and stores that sell cellphones for brand recommendations, and you’re sure to hear Apple and Huawei among the top brands they would recommend. With Apple improving power and functionality with its latest release of the iPhone XS, its new camera technology, battery life and overall display makes it a highly sought-after device worldwide. But how does this stack up to the Huawei P20 Pro? Huawei’s current flagship model, the P20 Pro packs a lot of punch with its triple camera feature and plenty of power. Here is an in-depth head-to-head review of the two devices. We look at their design, price and distinct features. Both iPhone XS and Huawei P20 Pro have notched displays with streamlined glass back, but Huawei gets a bit of an edge with its beautiful gradient color, glistening to the eyes. Apple meanwhile, has opted for a plain coloring on its glass back, and while it offers an array of color options, it’s not as striking as Huawei’s shining hues. 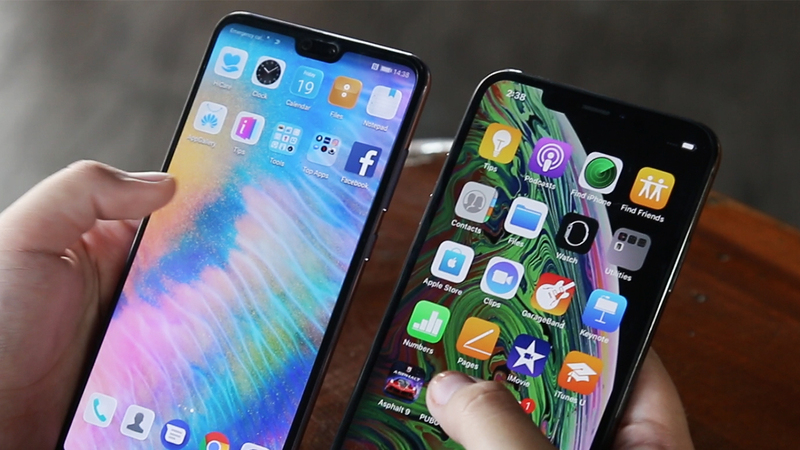 A comparison of the front portion gives the point to Apple, thanks to the full screen view without the distraction from a “chin” bezel at the bottom of the device, seen on the P20 Pro. Both phones’ screens are relatively comparable with OLED technology, but Apple edges Huawei out, albeit only slightly with its expanded color gamut, giving an improved range over last year’s iPhone model. Right now, the P20 Pro is the benchmark for the best smartphone camera around. The triple camera function features a main 40MP sensor flanked by 20MP monochrome and 8MP telephoto cameras. A powerful optical zoom (3x) and hybrid zoom (5x) give users consistently impressive shots, with clear snaps even from a significant distance. In fact, even nighttime shots are high quality with Huawei P20 Pro, something rare given that it is a mobile phone. Even with low light and shaky hands, the P20 Pro is able to hold the shot for 6 seconds, guaranteeing zero smear and blur even in the hardest (photo) circumstances. Now, the iPhone XS is also one of the best point-and-shoot options on the market. Users get two 12MP cameras on the rear just like iPhone X, but smarter algorithms and sensors render better shots with the Smart HDR mode. Simultaneous shots are stitched together to create the perfect shot in a snap. Of note as well is the increased dynamic range, and even low-light shots are made better with the iPhone XS. Overall, the iPhone XS comes pretty close to the Huawei P20 Pro but Huawei is still the clear winner when it comes to producing the best quality photos. But if you prefer video to photos, the iPhone XS may give you more power and stabilizing features for your viewing experience than what Huawei can. The iPhone XS commands a higher price than its competition, with a couple hundred dollars more than Huawei P20 Pro. If you are dead set on getting an iPhone, you’ll definitely enjoy the upgrades and power of the XS. But if you are looking to try other options, the Huawei P20 Pro also has its own set of fantastic features and camera technology that are surely worth considering.